The park next door is a sight to watch. Anyone in the neighbourhood who can afford to rise early and leave home heads here—bent on fitness. Contributing to the morning hustle-bustle are a small band of middle-aged men and women taking yoga lessons; a laughter club letting out loud peals at regular intervals; siblings playing handball in what was conceived as a skating rink; some indulging in solo exercise shows, oblivious to others milling around; slow walkers dodging joggers; and grandparents standing guard over frisky kids. At least this riot of colour does not fade any time during the year. It’s a day-long affair in winter; in summer, the shouts and squeals peak in the morning and evening, but fade after dusk. It’s a rather large and well-maintained park, but not too conducive for the old and infirm. Its footpaths are uneven, with steps that break your stride every now and then. And yet, it’s a community space that a hundred-odd are very thankful for, every day. The sad part is that not all other green areas are as well looked after. Indeed, there isn’t enough open space in every locality in the city. Many public parks have been encroached upon, some have gone to seed, while a good number have been converted into parking lots because the lanes around are so cramped. Worse, a sense of ownership is missing, as in most other aspects of civic life in the Capital. A Taiwanese official who visited Delhi in 1993 and then in 2000 remarked on the progress the city had made in those seven years…better roads, signage, street lighting and connectivity, sure, but most of all he was impressed by its green cover. He said it was one the greenest capitals he had seen.But that, I mentally added, was because he was looking out of the Taj Mahal hotel, at Lutyens’ Delhi and not its dusty, unkempt counterparts. 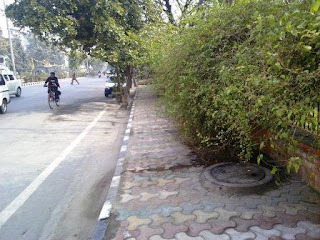 Untrimmed bushes turn a footpath into a convenient urinal. No doubt the city has gained much more in terms of looks, courtesy the chaotic beautification drive for the Commonwealth Games. But its citizens need much more: clean and safe public places (not more malls, thank you); accessible and affordable sports clubs; sidewalks free of squatters to allow pedestrians some manoeuvrability, overbridges, parking lots; a urinal at every kilometre for Delhi’s eternally piddly men—and efficient policing. Newspapers the other day ran stories on 75 years of ‘the lung’ of Delhi—Lodhi Gardens. But Delhi needs many, many more lungs. Only then will people take to that healthy habit called walking. To reach a park today, you have to negotiate smelly roadsides, broken tiles, bushes where there ought to be none, vendors, parked bikes, even poop. 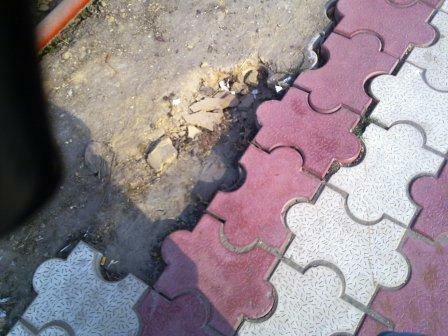 I clicked a stained pavement (top) and a half-laid footpath nearby that had been ‘beautified’ for the Games. If we can just repair and maintain what we’ve built, even if we don’t add more, Delhiites will cheer. For now, there are too many deterrents against venturing out on foot. I’m resigned to taking short walks within my housing society’s compound. And there will be thousands like me who would rather gain weight than risk injury (yes, treadmills too are not universally beneficial).